Menno H. Epp: teacher, pastor, and denominational leader; born 11 April 1932 at Lena, Manitoba to Heinrich M. Epp (9 February 1904-13 April 1958) and Anna (Enns) Epp (24 October 1902-16 December 1958). He was the fifth son in a family of eight sons and five daughters. His siblings were: Henry, Bruno, Frank, Anna, Martin, George, Susan, Lydia, Linda, Alvin, Viola and Rudie. Most of his siblings served active roles in church work. When Menno was 13 the family moved to Abbotsford where his father became pastor of the West Abbotsford Mennonite Church. On 26 July 1957 he married Irma Wiens (6 February 1933-28 September 1990) in Herschel, Saskatchewan; they had two daughters and one son. After Irma's death Menno married Elisabeth (Elsie) Peters Neufeld on 10 April 1993. In 1996 Menno and Elsie began an active retirement and moved to Saskatoon, Saskatchewan, where Menno died on 2 August 2011. 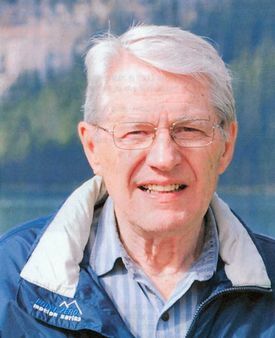 Menno completed his secondary schooling in British Columbia, and in 1953 attended Canadian Mennonite Bible College in Winnipeg, Manitoba, graduating three years later. He taught at Bethel Bible Institute in Abbotsford from 1957-58 to 1962-63 and from 1964-65 to 1968-69 with nine years as principal. During these years he served as an inspirational local and provincial youth leader and helped to establish Camp Squeah in 1960. Menno loved the outdoors and the mountains, and served as director of Camp Squeah in its initial years. He was ordained to the ministry in 1964 at the West Abbotsford Mennonite Church. From 1967 to 1969 he attended the Associated Mennonite Biblical Seminaries (AMBS) in Elkhart, Indiana. From 1972 to 1975 Menno served as secretary, and from 1991 to 1996 as moderator, of the Conference of Mennonites in Canada. He also served five years as chairperson of the AMBS board. From 1971-1983 Menno was pastor of the Foothills Mennonite Church, Calgary, Alberta. From 1984-1998 he pastored the Leamington United Mennonite Church, and in retirement he pastored the Osler Mennonite Church, Osler, Saskatchewan from 2002-2004. He often resourced congregations with counselling and encouragement in difficult times. The Menno Epp family established an endowment fund at Canadian Mennonite University--the Irma (Wiens) Epp Memorial Bursary was awarded to students pursuing studies in church music. At his death he was a member of Wildwood Mennonite Church in Saskatoon. Menno and Elsie traveled extensively both as tourists and as tour leaders through areas important for their Mennonite history and in Bible lands. Kehler, Larry. "Longtime Bible school teacher/pastor dies." Canadian Mennonite Vol 15, no. 18 (19 September 2011): 30. Wiebe, Victor G. "Epp, Menno H. (1932-2011)." Global Anabaptist Mennonite Encyclopedia Online. February 2013. Web. 25 Apr 2019. http://gameo.org/index.php?title=Epp,_Menno_H._(1932-2011)&oldid=142154. Wiebe, Victor G. (February 2013). Epp, Menno H. (1932-2011). Global Anabaptist Mennonite Encyclopedia Online. Retrieved 25 April 2019, from http://gameo.org/index.php?title=Epp,_Menno_H._(1932-2011)&oldid=142154.